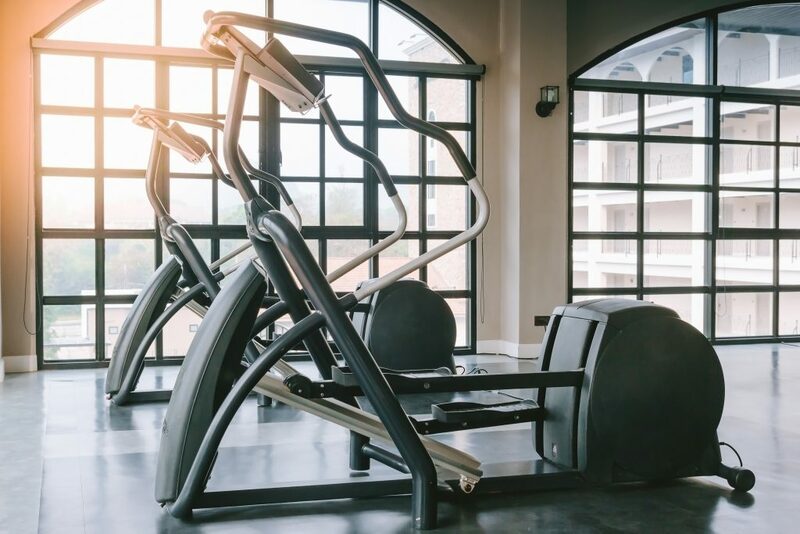 The best ellipticals for rooms with low ceilings need to be comfortable to use, have enough features to provide a solid workout, and most importantly, have a low step-on (or step-up) height. Ellipticals make great home fitness equipment, unfortunately not all of our homes are equipped for ellipticals. See what I did there? Anyway, ellipticals tend to require more ceiling room than most fitness equipment because of the arc of motion you go through. If you are tall and your ceilings are low, it could be a recipe for disaster. Giving yourself a concussion probably isn’t one of the benefits you’re thinking of when purchasing a new elliptical. If you are planning on putting your new elliptical in a basement or room with a lower than average ceiling height there are a few things you need to know beforehand. We all know ellipticals are great because they provide cardiovascular exercise and they are low-impact. They can also offer a pretty solid full body workout if you are using one with upper body handles. Unfortunately, nothings perfect in this world, not even ellipticals. The biggest downside to ellipticals are how much space they take up. Ellipticals are right there with treadmills as the pieces of home fitness equipment that take up the most floor space. Treadmills are wider, but high end ellipticals can be almost as long. And ellipticals throw an extra monkey wrench in the mix with the ceiling height consideration. If you’re reading this, you’re probably a little concerned about how high your ceilings are. Let’s discuss this a little and see if you actually should be worrying about this or not. The average ceiling height in American homes is 8′. With newer construction, it’s not uncommon to see 9′ and 10′ ceilings. If you have a 9 or 10 ft ceiling, you have nothing to worry about- choose any elliptical you like and you will have plenty of head space regardless of how tall you are. Shaq could use an elliptical in room with a 10′ ceiling. If you have 8′ ceilings, you need to check a few things. First thing to consider is how tall you and any other possible elliptical users are. If you are under 6′ tall, you really shouldn’t have any issues with 8′ ceilings. You should be safe to purchase any elliptical you like without considering how high the step-up is. If your exercise room has a ceiling that is lower than 8′ or you are over 6′ tall, than you need to do some math. Don’t worry, it’s easy math. You basically need to figure out high off the ground the elliptical is going to put you at its highest point during use. This is commonly referred to as the step-up height or step-on height. Add this value to your height and you will know how high your head is going to be while using said elliptical. As long as that value is lower than the height of your ceiling, you should be ok. But it’s always a good idea to have a little buffer room, I suggest 4-6 in, to be safe. Example: I’m 6’1″ (73 in) tall. Let’s say the elliptical I’m considering has a step-up height of 14″. 73 in + 14″ = 87 in. I will need a ceiling taller than 87 in in order to ensure my head doesn’t hit during use. An 8′ ceiling is 96 in, so I would have plenty of room. A 7′ (84 in) ceiling would be a no go. This is all sounds good and pretty straightforward so far, but the problem is it can be difficult to find a precise step-up height for most ellipticals. Some manufacturers supply it with the specs, but most don’t. You can search online for these numbers until you’re blue in the face and often leave just as confused as you were before you started. If you read user reviews, you will see different values for the step-up height for the same machine. And then there are the ellipticals with adjustable incline settings. Adjusting the incline doesn’t necessarily increase the step-up height, but it’s different from machine to machine. I like concrete answers to these questions and it seems difficult to find them. But I have some info for ya here that I think will help. Most home ellipticals have a step-up height between 12-14″. If the step-up height is unknown, add 18″ to the height of the tallest user to determine the lowest safe ceiling height. This 18″ estimate will include the step-up height and also a little safety buffer. Something else to consider is that front drive ellipticals tend to be a little lower to the ground, making their step-up heights a little lower. When in doubt, you could always contact the manufacturer directly. Horizon Fitness and Nordictrack are also known for having lower step-on heights. Fitness Reality is a member of the Paradigm Health & Wellness family, who also contains the Exerpeutic brand. Like Exerpeutic, Fitness Reality specializes in making affordable home fitness equipment. The X Class 710 is a great example of their work- nothing fancy, just a solid machine that gets the job done. The X Class 710 is a compact machine with a low step-up height between 12-14″. This machine falls in the quality budget category (I just made that category up by the way)- it’s more expensive than the $200-$300 machines that feel as cheap as they are, but well under $1000. For the price, Fitness Reality does a good job of loading it with features. This elliptical has a 44 lb flywheel, which is heavier than most. The heavier flywheel will help give the 710 a smoother feel during use. As you build up the momentum, the weight of the flywheel will help it spin, which reduces the “choppy” stop-and-go feeling of a cheaper elliptical. The Fitness Reality X Class 710 also has a 20″ stride length, which is impressive for an elliptical in this price range. Stride length is arguably the most important feature in terms of overall comfort. 20″ is long enough to comfortably accommodate most users. Actually, Fitness Reality reports the 710 can fit users between 5’1″ – 6’4″. At 6’4″ though, you better have at least an 8′ ceiling. Overall, the Fitness Reality X Class 710 has a lot to offer, especially for such an affordable elliptical. The compact size and low step-up height make it a nice choice for rooms with low ceilings. If you’re looking for a more technologically advanced elliptical, the Horizon Fitness Elite E7 might be a good bet. Horizon Fitness is part of the Johnson Health Tech family, the 3rd largest fitness equipment manufacturer in the world. Horizon also produces treadmills and exercise bikes for the home. With a step-up height of only 10″, the Elite E7 is a smart choice if your ceilings are low (or you are tall) and every inch counts. This is a more advanced elliptical than the X Class 710 and it has a price tag that matches. The E7 is priced in the mid-high end category ($1000-$2000). The Elite E7 has a 23 lb flywheel (I told you the 710 had a crazy heavy flywheel) which is plenty to offer a smooth riding experience. Horizon has also developed and included their patented “SixStar Frame” system- basically just their term to show how ergonomically correct the design of the machine is. The E7 also has a 20″ stride length which really is the preferred distance for maximum comfort. This elliptical also comes with a power incline option of up to 10 deg to increase the difficulty. It also gives you more control over the feel of the ride as well as allowing you to concentrate on different muscle groups (higher inclines should activate your glutes more). The Horizon Fitness Elite E7 has a sturdy comfortable frame, a good warranty, and is loaded with workouts and extra features. With the 10″ step-up height it’s a great choice for low ceilings. There have been some complaints about faulty operation at delivery, but Horizon’s customer service is pretty solid. The Nautilus brand needs no introduction, they have been a leader in producing quality home fitness products for decades. The Nautilus E616 Elliptical Trainer is no exception. It’s a popular mid-grade home elliptical that offers users a good combination of high-tech features and durability. With a step-up height of 12″, the E616 is on the lower end of average heights. This machine is packing a 22 lb flywheel for a smooth ride and also has a 20″ stride length. To add to your comfortable experience, both sets of handlebars are padded and ergonomically located. The Nautilus E616 also has a motorized incline to add more variety and difficulty to your workouts. The incline maxes out at 10 degrees. The E616 is bluetooth compatible and can connect to the free Nautilus Trainer App as well as other popular fitness apps. If you are into fitness tracking you might like that this elliptical can also connect with the free Run Social app that allows you join other runners around the world through various scenic routes. Overall, the Nautilus E616 has a lot to offer for the under $1000 price range. It has a lot of workout variety and a low step-up height, making it a good choice when ceiling height is a concern. I’d like to see a better warranty on this machine, but it’s not awful for this price range. The E616 is highly rated by users. NordicTrack is another giant in the home fitness industry. They’re known for producing high-quality treadmills, ellipticals, and exercise bikes. The SpaceSaver ellipticals are uniquely designed for homes with limited floorspace (hence the name). The step-up height is about 14″ on the SE7i, but NordicTrack does recommend you add 17″ to your height to ensure you have plenty of head space. The SpaceSaver SE7i is different from the 3 previous ellipticals in a few key ways. The first thing you will notice is that this is rear drive elliptical. Opinions vary on which is better, but users tend to feel a little more balanced on a rear drive machine. Sometimes on a front drive elliptical you feel like you have to lean forward more to stay balanced. Second, the SE7i is a folding elliptical. Yes, you heard me correctly, this elliptical can fold in half for storage. It folds and is stored vertically, which cuts the floor space requirements in half. Simply unfold and use whenever you need it. This is a game changer if you have low ceilings and limited floor space. The SpaceSaver SE7i comes with an 18 lb flywheel, a little smaller than the others we’ve seen thus far. It also has a smaller stride length of 18 in. I’m guessing NordicTrack did this to make it a little more compact. With the short stride length, this elliptical is going to be best suited for users under 6′. The taller folks out there might feel a little cramped. The SE7i does have a power incline that can reach 8 deg. for added workout variety. The NordicTrack SpaceSaver SE7i makes a great treadmill for low ceiling homes because the step-up height is only 14 in. Assembly is a breeze on this model and it can fold in half and be stored vertically. It comes loaded with plenty of workout programs and some higher-tech functions that should make it fun to use. The stride length is on the smaller side, so I would recommend this treadmill for people under 6′ tall. User reviews are all over the place, people either love it or hate it. The SE7i is very well priced though. The Sole E35 is the highest quality elliptical on this list. In terms of durability and comfort, it’s hard to beat. The step up height on this elliptical is around 14″, but it has a power incline up to 30 deg that might increase your height a little more. If you plan on using the incline settings and are at least 6′ tall, you better have 8 ft ceilings. The most noticeable thing about the Sole E35 is how sturdy it feels. Stepping on this machine feels like it does when you step on an elliptical in your local gym. It’s a bigger, heavier elliptical and the difference is hard to miss. In a good way. The Sole E35 has a 25 lb flywheel, which is on the heavier side for home ellipticals. Heavier is preferred for a smoother ride. Another great quality about the E35 is its long stride length: 20 in. Some reviews report it has up to a 22″ stride length- I think this is because the E35 has adjustable foot plates. Adjusting the plates might give you an additional in or so. Either way, it definitely give you the ability to custom fit the machine to your needs. The pedals themselves are large to begin with, which makes it more comfortable and more likely to fit larger users. I mentioned above that the E35 has a power incline up to 30 deg. This will give you one mother of a workout. Combine that with the 16 levels of resistance and you can fine tune your workout to your liking. The Sole E35 is a beast designed to handle users of all sizes. The long stride length and high max weight capacity makes this a great elliptical for the big and tall users. It has a solid warranty and is one of the most highly rated home ellipticals on the market. The biggest downside is that it is lacking in the bluetooth department. That said, the newer models (2016) have been made bluetooth compatible. If that doesn’t bother you and you have the budget, this a great elliptical. This elliptical is always going on sale, so check around for best price. The best ellipticals for low ceilings need to have low step-up heights and enough features to keep you interested. Because let’s face it- even if the elliptical fits your space, if you don’t enjoy using it, odds are you won’t. In order to determine how much ceiling height you need, you can add the machine’s step-up height to your height. But you should always add a few more inches to ensure a little buffer zone. It will hurt if you hit your head on your ceiling! Or worse yet, if you hit your head on a light or ceiling fan and break something. If you aren’t sure about an ellipticals step-up height, take your height and add 18″. This will give you a great estimate of how much room you need. Most homes these days have ceilings that are at least 8′ high. With 8′ ceilings, you should be fine with any elliptical as long as you are 6′ or less. If your ceiling is under 8′ then you definitely fall into the “low ceiling” category. Unfinished basements often fall in this category. If you are under 6′, odds are you can still find an elliptical that will fit. If you’re over 6′ and have ceiling under 8′, you’re really going to have to do the math to make sure it’s going to work. You may even want to consider a treadmill or bike. The Horizon Fitness Elite E7 has the shortest step-up height of any machine on this list at 10″. If you are really cutting it close with your height calculations, go with the E7. The Sole E35 is the highest-quality elliptical on this list. If you are looking for something that will feel like a commercial grade machine, this is your best bet. I hope this was helpful. If you have any questions or comments, leave them below and I’ll get back to ya. How did you find the step up height of the Fitness Reality X-Class 710? I saw it reviewed on a different sight with a step up height of 15″ to 21″ (see http://bestfitnesseq.com/fitness-reality-x-class-710-elliptical/). I’m 5’10” and have a 7 foot ceiling. I obviously don’t want to purchase a machine that won’t fit my space, but I’m having a hard time finding out the actual dimensions. I’ve contacted the company, but have yet to hear back from them. Great question Bryan. It’s incredibly difficult to find step-up heights for these machines and often the customer support folks you contact at these companies don’t have the exact numbers either. I came up with 12-14″ based on the fact that this is a front drive elliptical without power incline- the average step-up height for this type of home elliptical is 12-14″. I read the review you linked too and it’s a very well done thorough review. That said, there is no way the step up height is anywhere near 21″. The pedal might be around 21″ at the highest point during rotation, but that doesn’t mean your body is being elevated that high during use. Think about how it feels when you use an elliptical- your legs move a lot more than your body does. But honestly, in your situation whether the step up height is 14 or 15″ doesn’t matter- your ceiling is too low for this machine either way. Best case, if the step up height is 12″, that still puts your head at 6’10” during use. And if you come up on your toes at all, you’re going to make contact with your ceiling! Remember, you need a few inches of buffer for safety. When in doubt, add 17-18″ to your height, and that’s the lowest your ceiling should be. If you really want an elliptical, go with one that has a 10″ step up height, but you would be safer with a bike or treadmill.